… but people should take pride in their jobs. No matter what. Almost all of them wear sneakers now, which is not Santa-like at all. Come on. Hardly any of them wear fur around their hats, and most of their tops looks like comfortable robes or track jackets. I hardly ever talk to any of these types when I see them on the street because I’m afraid I’ll get in a fight and they’ll think they can take me since they’re younger. But today I had to. A red cowboy hat? That will not fly in these parts. I stopped and tried to tell him that in a calm voice and he ignored me. 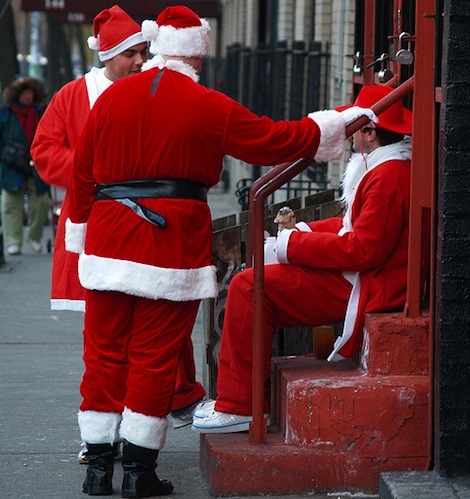 He and his friend (in their hundred dollar sneakers, as if Santa would wear those up in the N.P.) just kept talking between themselves. 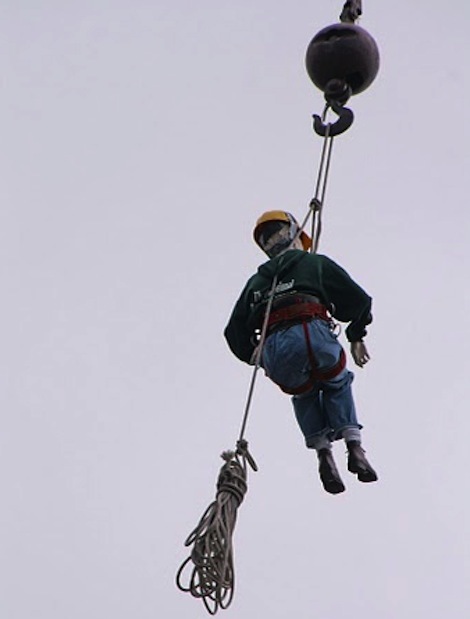 Should Mom go bungee jumping? So I went for a walk and I saw the most bizarre sight ever. A crane was lifting a dummy up in the air, and don’t ask me why because I do not know. I yelled “hang in there Ma” and the stranger asked me what’s her first name and I made up the name Mary Lou, so he was yelling “Hang in there Mary Lou” and then a few other people gathered and yelled up to her and I was thinking what a master I am. … I thought I’d show up and he’d be able to go out discoing with me, like old times. But it’s Easter tomorrow, he says, which is news to me … but, so what? He says we have to decorate, which sounds to me like a quick thing, hide a few eggs after his kids go to bed and we’re outa here, right? His wife comes in with a bunch of brown furry cloth and says she needs more time to sew the duck’s chocolate bunny suit, so she wants us to go out and string the lights. Lights? Is this Xmas? But indeedy, she has a string of lights shaped and colored like Easter eggs and we’re out there in the yard and I say, hey, don’t kids search for eggs in the morning, when the sun’s out? He says, well, they get very excited and they get up early. Barely dawn. 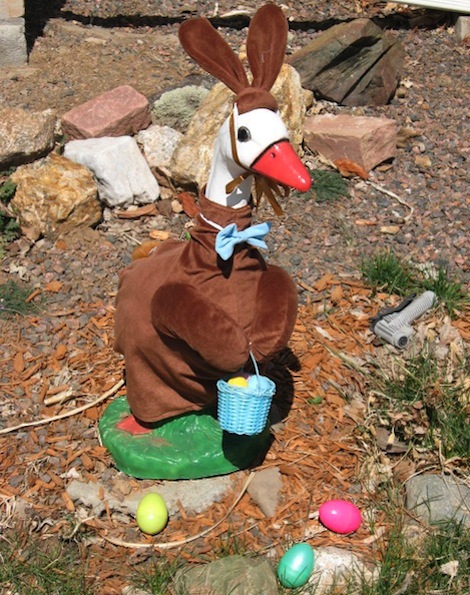 Wait a minute, did she say the chocolate bunny suit is for a duck? 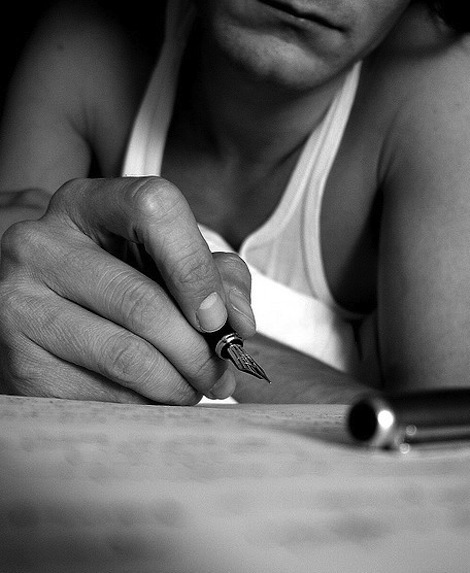 … of course I have a picture in my head of what he looks like when he’s writing to me. Beautiful hands, and a pen like the one I used to use in second grade, the kind you have to buy ink cartridges for, and you see the ink sloshing around in there, and you stick it carefully in the pen before you break the little tab, so it’s right in place, and the ink doesn’t spill all over. Only I picture his pen is fancier. … the three of us were staring up for so long that other people started to gather. Maybe they thought there was something in the sky because most people don’t stare this long at a statue. I read this out loud from the inscription: “potaverunt me aceto” and one of the Italian guys, Luigi, says it means “they gave me vinegar to drink” which still doesn’t make it make any sense to us. 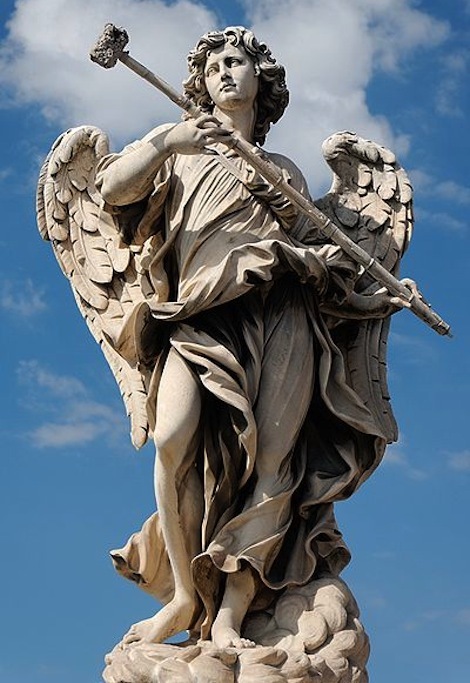 So I tell him we think it looks like the angel is holding a sponge mop. He says he doesn’t know. He just sees the statue every day on his way to work, and never gave it much thought. In Italian, he asks the other people standing there. He tells me someone said it’s a Bible verse. “They gave me vinegar.” It’s in Psalms. But I ask him to ask them what drinking vinegar has to do with holding a sponge mop. He does. Then he says nobody can explain. But they don’t move along on their way. They just stand there with us staring at the statue. Then we start talking about food, and Luigi translates for us. Then almost everyone who was standing there ends up eating lunch together at a place nearby. She ignored my bad mood and said “oh chopped liver, that sounds delicious” but I thought she was kidding. 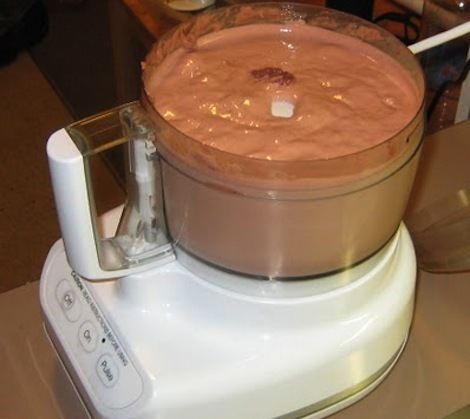 So tonight I walk in the kitchen and I see her food processor full of chocolate mousse and I get a clean spoon and take a big bite and, well, I’m surprised I didn’t just drop dead because of how much I wanted to die. Then she walked in and I asked her, what’s in that? She said beef liver. Pork fat. Onions. Butter. Flour. Milk. Eggs. Chopped liver is something I would not recommend to my worst enemy even if he kidnapped my dog or took me out to the dessert and abandoned me without a drink of water. … never believe anything I say. 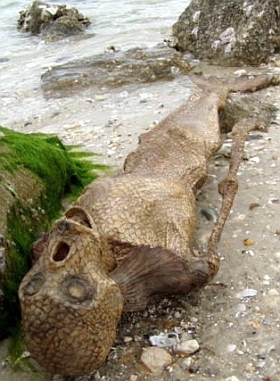 I said I thought mermaids could exist and then I found this photo of a mermaid corpse, so maybe they’ll listen more when I say something. I still can’t exactly explain how a human respiratory system could breathe underwater all the time. I ordered a book called “How to Breathe Underwater” but it turned out to be a collection of short stories. So I gave it to my aunt for her birthday. I looked on the internet and found a page that says “what is the human world record for holding their breath underwater the longest?” and someone answered “1 year” so maybe that was written by someone who knows a new breathing secret that could explain it. A hippo can hold his breath for a long time and so can David Blaine. … told me I’ve had the same hairstyle for 20 years and I hadn’t even realized it. But damn damn damn. He’s so right. And now all of a sudden, I want a whole new look and I can’t decide what it should be. Roger: Please please do that. Yes. Please. Grandma: If you dye your hair black, it will never recover. I knew a gal who did it back in the ’50s and her life after that was filled with regret. Misty: You’ll never figure out how to put on that much makeup. Well, I guess I could show you. Bryan: I like it a LOT. Crystal: Um, what color is the sky on your planet? … since Dad died. We were looking through a box of his papers (because Sam next door said there was an off chance we’d find something valuable). 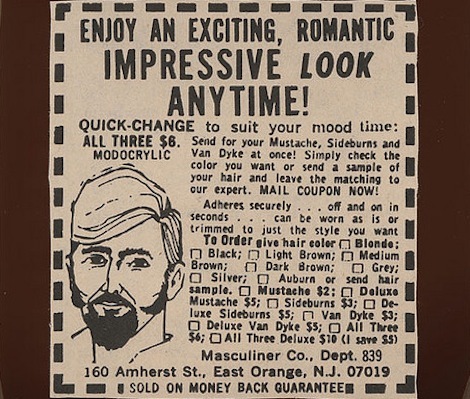 One thing we did find was this advertisement cut from the newspaper. Turns out that all that Ringo facial hair he had in pictures from the ’70s was probably fake. Then she went in her room and turned on her Nirvana tape for the rest of the night. Loud. And Dad wasn’t even there to stop her. So I did it, I made a costume with big feathers, silver boots, fishnets and not much else. Turns out ‘anything goes’ was an exaggeration. A GIANT exaggeration. I’ve never been stared at like that. Embarrassment might’ve been the worst part of the day, but oh wait, no, it was being arrested for indecent exposure!!!!!!!! !